Erupting clouds of plasma are suspended in the Sun's hot corona. Every feature in the image traces magnetic field structure. Astronomershave recorded heavenly music bellowed out by the Sun's atmosphere. Snaggingorchestra seats for this solar symphony would be fruitless, however, as the frequencyof the sound waves is below the human hearing threshold. While humans can makeout sounds between 20 and 20,000 hertz, the solar sound waves are on the orderof milli-hertz--a thousandth of a hertz. The study,presented this week at the Royal Astronomical Society's National AstronomyMeeting in Lancashire, England, reveals that the loopingmagnetic fields along the Sun's outer regions, called the corona, carrymagnetic sound waves in a similar manner to musical instruments such as guitarsor pipe organs. 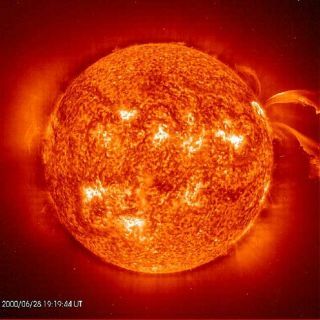 Robertusvon Fay-Siebenburgen and Youra Taroyan, both of the Solar Physics and Space Plasma Research Center atthe University of Sheffield, and their colleagues combined information gleanedfrom sun-orbitingsatellites with theoretical models of solar processes, such as coronal massejections. They foundthat explosiveevents at the Sun's surface appear to trigger acoustic waves that bounceback and forth between both ends of the loops, a phenomenon known as a standingwave. "Thesemagnetic loops are analogous to a simple guitar string," von Fay-Siebenburgen explained. "If you pluck a guitar string, you will hear the music." In thecosmic equivalent of a guitar pick, so-called microflares at the base of loopscould be plucking the magnetic loops and setting the sound waves in motion, theresearchers speculate. While solarflares are the largest explosions in the solar system, microflares are amillion times smaller but much more frequent; both phenomena are now thought tofunnel heat into the Sun's outer atmosphere. Theacoustic waves can be extremely energetic, reaching heights of tens of miles,and can travel at rapid speeds of 45,000 to 90,000 miles per hour. "These[explosions] release energy equivalent to millions of hydrogen bombs," von Fay-Siebenburgensaid. "Theseenergies are plucking these magnetic strings or standing pipes, which set upstanding waves--exactly the same waves you see on a guitar string," vonFay-Siebenburgen told SPACE.com. The "sound booms" decay to silence inless than an hour, dissipating in the hot solar corona. The musicalfinding could help explain why the Sun's corona is so hot. While theSun's surface is a steamy 10,000 degrees Fahrenheit (5,538 degrees Celsius), plasmagas in the corona soars to more than 100 times hotter. "How canthe atmosphere above the surface of the Sun be hotter if nuclear fusion happensinside the Sun?" von Fay-Siebenburgen said. If astronomers can get a clearerpicture of what's going on inside these magnetic loops in the Sun's atmosphere,they have a better chance of finding the answer. Anotherrecent study using images from Hinode's telescope revealed twistedmagnetic fields along the Sun's surface, which store huge amounts ofenergy. The magnetic fields can snap like a rubber band; when they do, theymight release energy that could heat up the corona or power solar eruptions andcoronal mass ejections, the researchers say.